The UN system in Kyrgyzstan with support of the European Union completed a joint project “Operationalizing Good Governance for Social Justice in Kyrgyzstan”, to operationalize good governance in the context of improving access to public service delivery and addressing the rights of the most vulnerable groups (children, women and youth). Strengthening of rural women and girls voices via community radio and multimedia centers was the specific focus of the project. 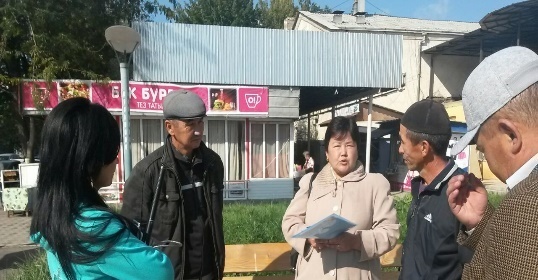 The project started in October 2011 and was implemented during 36 months till October 2014 in 30 rural municipalities in seven regions of Kyrgyzstan. This project was implemented by four UN Agencies - UNDP, UNICEF, UN Women and UNESCO. The European Union co-financed this project together with the above-mentioned UN agencies. 13-14 October 2014 in Bishkek, the leading community media volunteers from seven regions of Kyrgyzstan took part in the training of trainers workshop. Sixteen volunteers of 13 community media attended the training.